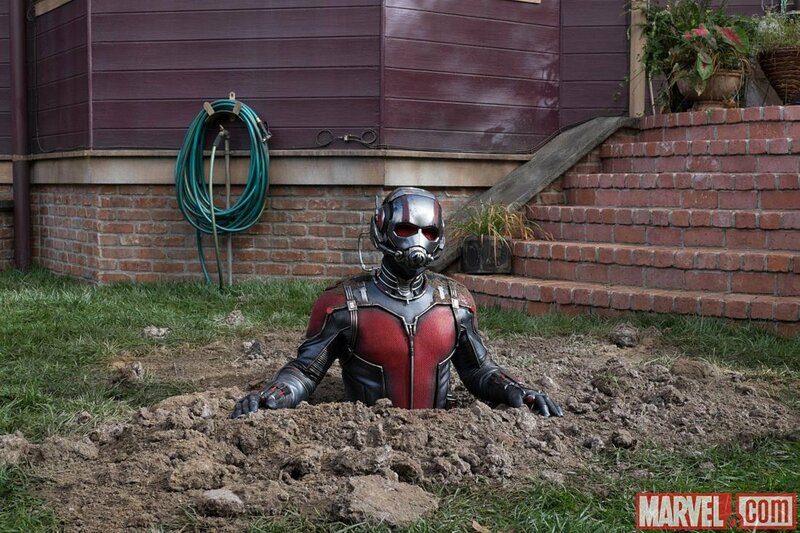 It’s been a long and strange road to bring Ant-Man to the screens. When Marvel announced they were getting into producing their own movies, it was one of the first three projects on the slate alongside Iron Man and The Incredible Hulk. The character was never particularly popular, but it was a long-time favourite of cult director Edgar Wright and Marvel was set to make it purely to work with him. 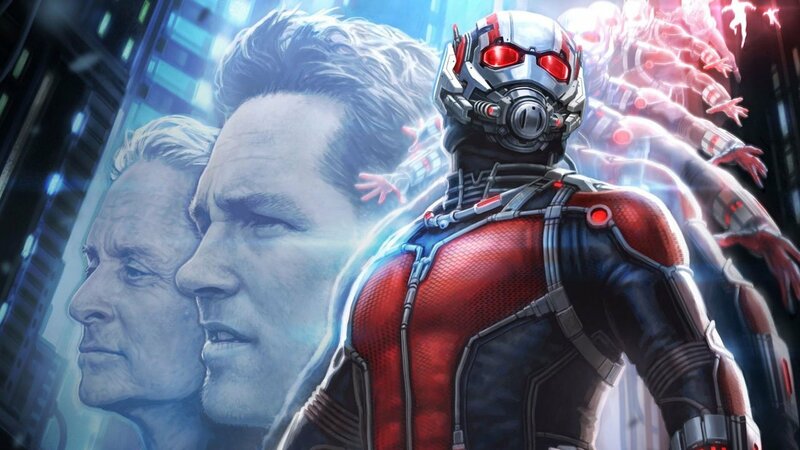 Ant-Man was subsequently delayed a few times so that Wright could go off and work on Scott Pilgrim and The World’s End, but the studio stuck by him. He eventually cast the movie, approved designs, started the effects teams working, and then quit the project a few weeks before shooting was set to begin due to creative differences. Paul Rudd and Will Ferrell’s long-time writing partner Adam McKay then cranked through another draft of the script and Peyton Reed (Bring It On, Mr. Show) replaced Wright in the director’s chair. The internet went crazy over concerns that Marvel Studios crushed a beloved director’s vision and blah-blah-blah. It looked like the movie might be the first big Marvel misfire. Yet, now the flick is here and it’s actually a ton of fun. Somehow, Marvel pulled off another win. The flick kicks off in 1989 with a Michael Douglas younged up through CGI, screaming in a board meeting about protecting his secret shrinking formulas. Fast-forward to present day and the older Douglas sees his formulas stolen again, this time by the dastardly jerk now in charge of his company (Corey Stoll). Even worse, Stoll plans on selling the militarized shrink suit to Hyrda. Thankfully, Douglas has a plan (whew!). While leaving his daughter (Evangeline Lilly) to supervise the jerk planning on using his technology for evil, Douglas sets a sting operation to find a hero. Paul Rudd plays a long-suffering thief who is a damn good guy on the wrong path. Rudd breaks into a house along with some of his dumbbell thief friends (led by the always delightful Michael Pena) that turns out to belong to Douglas. Rudd assumes he’s stealing money to help his daughter, but actually ends up with Douglas’ shrink suit. Soon Douglas and Lilly are training him to use the shrink suit to become the world’s tiniest superhero (he still has full sized super strength while tiny and can control ants, because why not? ), but only so that he can break into Douglas’ old company and steal back his technology. So, it’s both a superhero origin story (which is tediously familiar) and a superhero heist story (which has never been done before). The lynchpin to Ant-Man’s success is undeniably Paul Rudd. Since he has no tragically bestowed powers or supernaturally imposed destiny, he’s almost a superhero by accident. He’s a guy who is self-conscious and uncomfortable about his superheroics, which is a pretty clever variation on the superhero theme that suits Rudd’s charming doofus comedic persona well. Given that Marvel has a generally comedic tone to their universe, they oddly don’t have many heroes who are genuinely funny, so he should fit in well. Surrounding the lead, Douglas grounds it all with old movie star power (kind of like Robert Redford did in Winter Soldier last year), Lilly tosses in some spunky charm with Rudd that kicks (an end credits scene suggests that she could be a hero herself soon enough), and Michael Pena scores so many laughs that you’ll wish he could somehow get a spin-off film. It’s a pretty remarkable cast overall, which isn’t too big of a shock since it was Wright’s cast and he’s pretty good at such things. The only actor who doesn’t offer much is Corey Stoll and to be fair, that’s not really his fault. It’s impossible to watch Ant-Man without trying to spot what changes were imposed on Wright that forced him to leave, and the villain role is clearly one of them. Without giving too much away, the film seems to be setting up a third act twist in which Douglas’ Hank Pym becomes a secret villain due to his most famous backstory in the comics. His Yellow Jacket villain costume is there as is his established missing wife. But, the movie doesn’t go there because a Disney summer movie couldn’t. Instead, Stoll’s character has out-of-place scenes awkwardly establishing his villainous intentions early and the disappearance is tied to something that’s clearly set up for the Dr. Strange movie. 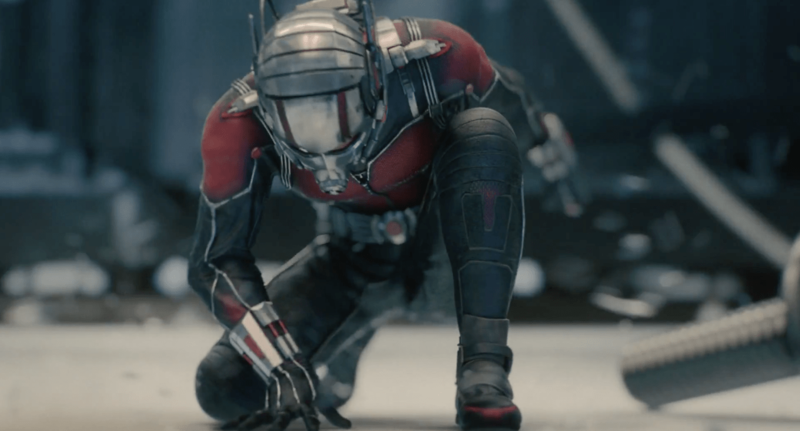 It’s clear that the overall narrative of the MCU was forced into Ant-Man and as the movie stumbles toward the third act, the narrative gets a little messy by cramming that in (especially when a scene involving an Avenger pops up for no apparent reason beyond including an Avenger for cross-promotion). It’s easier to imagine a more tightly scripted and self-contained Ant-Man movie that just can’t quite exist in a Marvel universe anymore. Thankfully, that 15-minutes or so of jumbled plotting is really the only major failing of Ant-Man, which works damn well otherwise. The mixture of Edgar Wright-style visual and verbal gags, along with some improv-heavy slacker humour clearly pulled in from Rudd and McKay’s script contributions give the movie one of the highest laugh counts of any Marvel property to date. Beyond that, the heist movie structure gives it a more contained and self-propelling narrative than many Marvel movies, but best of all are the miniaturized action sequences that offer some splendid eye-candy. 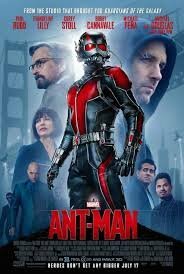 Peyton Reed does a remarkable job of staging surreal sequences like Ant-Man falling down a drain, running across a record, or battling on a child’s train set that are completely enveloping and also hilariously witty. The action is never merely CGI character A punching CGI character B, but an amusing shift in perspective that provides all sorts of new avenues for the action to go down. For possibly the first time in a Marvel movie, the final action sequence is actually the movie’s climax as the filmmakers brilliantly keep shifting perspective from the adrenaline-pumping action in small scale to the hilariously inconsequential image of what it looks like in real size. It feels like an Edgar Wright touch and even though it would have been exciting to see how he would have handled it all, Reed proves to be no slouch as the official director. That’s true of the movie as a whole, because as much as you’ll be tempted to dismiss it all with “what if” questions about Edgar Wright’s version, there’s no denying that the movie Marvel made is a hell of a lot of fun. 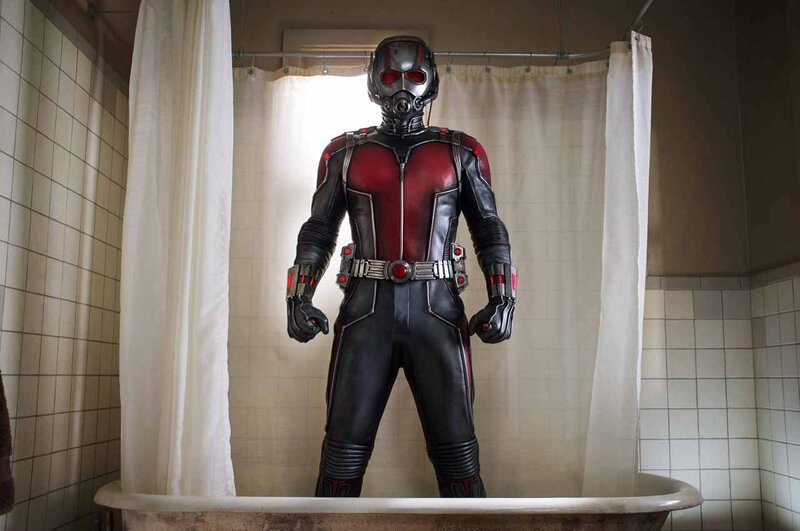 In fact, by the time you walk out of the theatre, you’ll probably be hoping to see an Ant-Man sequel. Who could have ever seen that coming? The lynchpin to Ant-Man’s success is undeniably Paul Rudd. Since he has no tragically bestowed powers or supernaturally imposed destiny, he’s almost a superhero by accident.